North Dakota Is Drilling HERE! Drilling NOW! Dems Say: Huh? What Oil? Where? 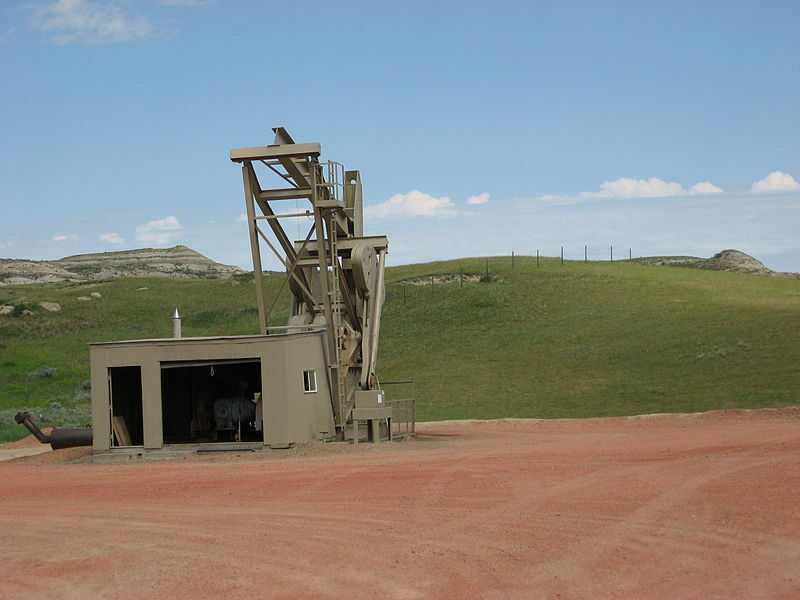 Oil drilling equipment in Western North Dakota. Please click on above image for a larger view in a new window. In their efforts to demonize off-shore drilling and drilling in ANWR to make sure the U.S. never achieves energy independence, the Democrats in Congress have managed to keep the Bakken shale formation out of the headlines. The U.S. Geological Survey says it is the largest oil find it has ever assessed, with a potential of 3.65 billion barrels, second only to ANWR, with an estimated potential of 10.0 billion barrels. “We are kidding ourselves if we think we can drill our way out of these problems”, House Appropriations Committee Chairman David Obey, D-Wisconsin said. Map of Williston Basin oil fields with reservoirs in Bakken Formation Area 200,000 square miles (Saskatchewan is north border). larger view in a new window. In April 2008 the USGS released this report, which estimated the amount of technically recoverable, undiscovered oil in the Bakken Formation at 3.0 to 4.3 billion barrels, with a mean of 3.65 billion.Later that month, the state of North Dakota’s report  estimated that of the 167 billion barrels of oil in-place in the North Dakota portion of the Bakken, 2.1 billion barrels were technically recoverable with current technology. North Dakota Oil… Democrats Say: Oil, What Oil? It seems the Democrats haven’t heard of the Bakken field, or are choosing to ignore it. OPEC and the oil speculators would not ignore it if they thought the U.S. was serious about having a national strategy to reach energy independence. This could bring down the price of crude immediately; we wouldn’t have to wait until the oil coming from Bakken was fully on stream. The following article tells what is happening in North Dakota. With gasoline prices at over $4.00 a gallon, this information should be blaring headlines in all mainstream media. BEULAH, N.D. – Oscar Stohler was raised in a sod house in western North Dakota and ranched there for nearly seven decades. He never gave much thought to what lay below the grass that fattened his cattle. When oilmen wanted to drill there last year, Stohler, 83, doubted oil would be found two miles underground on his property. He even joked about it. “I told them if they hit oil, I was going to buy a Cadillac convertible and put those big horns on the front and wear a 10-gallon hat,” Stohler recalled. He still drives his old pickup and wears a mesh farm cap” but it’s by choice….